At least according to this press release from several months ago. Assuming it's legitimate, why did Tony Carr sell his blog to a corporation back in February? What does it mean when a person claiming to spread truth out of concern for security and the nation and airmen and such, sells their blog to a giant media corporation? Isn't that some kind of conflict of interest? First, does Tony need the money? Is his retirement check not enough? Or does he need more money for future planned expenditures? Perhaps to run a campaign despite claiming several times that he has no plans for political office (which is what all politicians say, but we can believe Tony because he's not like other politicians). According to the press release from "BRIGHT MOUNTAIN ACQUISITION CORPORATION," Tony founded his blog and they purchased it stating that the "acquisition was made through a combination of stock and cash." Second, does having stock in a media company that owns your blog have any influence on your *ahem* journalism? According to the corporation's press release, Tony will "continue writing for the publication for the next five years." But what about incentives now and beyond those five years? Are those financial incentives any kind of conflict of interest? Are we witnessing the main-stream-media translation of his *snicker* alternative media that he loudly claims is a model for our mainstream Air Force? Does this news explain why he attacks Air Force Public Affairs? Does a private corporation that appears to specialize in military media have any kind of reason to want to take on taxpayer media sources? Third, since the "BRIGHT MOUNTAIN ACQUISITION CORPORATION" claims to own various military media sources, is there any chance it owns Duffel Blog or Doctrine Man or perhaps some media sources in Arizona that might have been vocal in the A-10 debate? What about Business Insider? Perhaps the Gannett company that owns the Air Force Times? I don't know what they own, I'm too busy flying airplanes to look deeply into this issue in order to pierce a corporate veil. But I certainly have my suspicions. It's much easier to manufacture a "majority" view and then manufacture consent when you own not one media source, but several others that appear to be independent. Of course I don't know if that is the case here. Readers can view the press release where Tony Carr sold his claimed "journalism" for a long term financial stake. 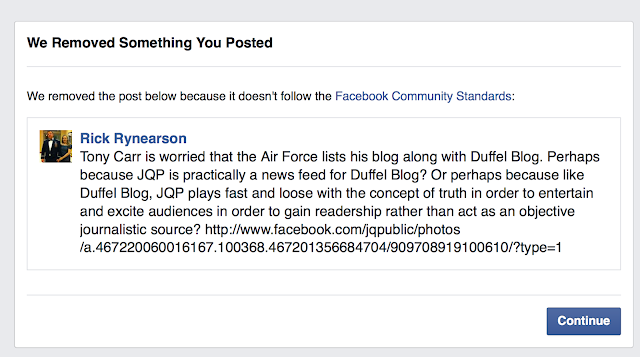 For more than a year now, Tony Carr has blocked me from posting on his JQP Facebook page. And for months now, when some of his readers mention me during particular threads, Tony has misinformed his readers that I am not blocked from posting on his page. Which is false, as Tony Carr certainly knows. But that doesn't stop him from misleading his readers in pursuit of his agenda (an agenda I believe is clearly to amass political power in order to advance himself personally). I couldn't care less about not being able to post on his page, but I do find his dishonesty and hypocrisy interestingly consistent. Today marked a new turn of events. I tried to log into my personal Facebook account, and found that somebody anonymously complained about a post I made on my personal Facebook page discussing a recent JQP comment, and the anonymous person had my post removed and my personal Facebook account suspended. For the first time ever, over the many years I have used Facebook, my account has been suspended. Again, despite the post being on my personal wall and not in a public arena. Facebook, of course, has a business model of capitulating to whiners and the teary-eyed-offended who used to get beat up in school, and Facebook doesn't have the resources to actually vet complaints in order to deny the worthless ones. Fortunately Facebook did provide me with the post that garnered the anonymous complaint. It did not, however, provide the allegations of why the post was bad, or who made the complaint. Just as Facebook didn't awhile back when another individual made a complaint against me and had my comments removed from my personal wall. That individual was also no fan of free speech and also wanted to control the message to include silencing others. You know the type. The type you meet off base in your private life who threaten to call commanders or the shirt on you in order to bully you. Those kind of people. Little tyrants with no respect for free speech who are much too insecure to debate ideas, cyber-mono-v-mono, knowing they will get pummeled. In public no less. Nah, they can't have that, it's too embarrassing and damages their public image. This comment about JQP that got me suspended was nowhere even in the realm of offensive. But that doesn't stop the claims from those who pretend to be offended in order to silence arguments that make them feel vulnerable and threatened. Even when such people claim to be all about free speech and debate and discussion but are, in actuality, only supportive of speech that they agree with. Like the person who reported my post as being somehow "bad" and who took steps to silence my private speech online. And who then naturally inspired me to share this discussion publicly in this blog post. When you can't compete in the realm of ideas with somebody who disagrees with you, simply ban them if you control the venue. If you are concerned they might be sharing opinions privately that you don't agree with, simply have the corporation that controls that venue ban them. To exercise this control, however, you have to own the medium or command numbers of dutiful followers to help exert pressure on media that you do not control. Just imagine what such a person would do to silence dissent if given the levers of government power. Without further adieu, I present the comment on my private page that led to the complaint and my account being suspended. Be warned JQP readers. Tony has gotten flag officers fired and, as he threatened to do to me in a Facebook message once, he will not hesitate to pull those levers of government power to silence those he disagrees with by calling their commanders. Reminds me of some general he once chastised for doing something similar, before Tony began peddling "treason" patches and mugs. Sometimes I look around me and notice the evils of the world. Poor people, theft, murder, children brought up in destitute homes. I want to tell those people, "Look, at least you're not a public servant squadron commander who serves at the pleasure of his or her boss who gets removed from that position and has to suffer the humiliation of a generous pension and health care benefits for life." Tony Carr has a fetish for his once top position, and his blog now hosts the whine letter of a former commander who chooses not to use his or her real name. Tony has said previously that squadron commanders are the best the Air Force has to offer. Of course anybody with half a brain knows that isn't the case and even Tony should know that, being that he continuously lambasts a leadership culture made up of former squadron commanders and decries their decisions to remove current squadron commanders. But he likes to talk outside both orifices in order to maximize his readership/followership. There is bad leadership in the Air Force. There are also some good leaders. Sometimes bad commanders are removed without a full record being supplied to Tony Carr for his approval, and sometimes good commanders are removed in the same way. Commanders serve at the pleasure of those above them. It's an additional duty, being a commander, just like SNACKO. The cult of power and prestige blinds the insecure to this fact. It's not noteworthy when a commander is removed from a position, and it's certainly not a tragedy. If you are a legitimate public servant who enters a command position dead set on being a good leader, then you should hold your head up high when you are removed from that position for being a good leader. Your career "sacrifice" (oh my) is for the benefit of those you purportedly served. Good commanders enter that position willing and happy to fall on their swords for mission and people. And they don't whine about being successful in that regard. You were probably told by past superiors, peers and subordinates that you were on a high trajectory, and maybe you started to believe your own press. The reality is those dreams are shattered. Stop whining like it's some kind of fatal wound and life defining and/or ruining experience. Dreams shattered?? Rub some dirt on it. 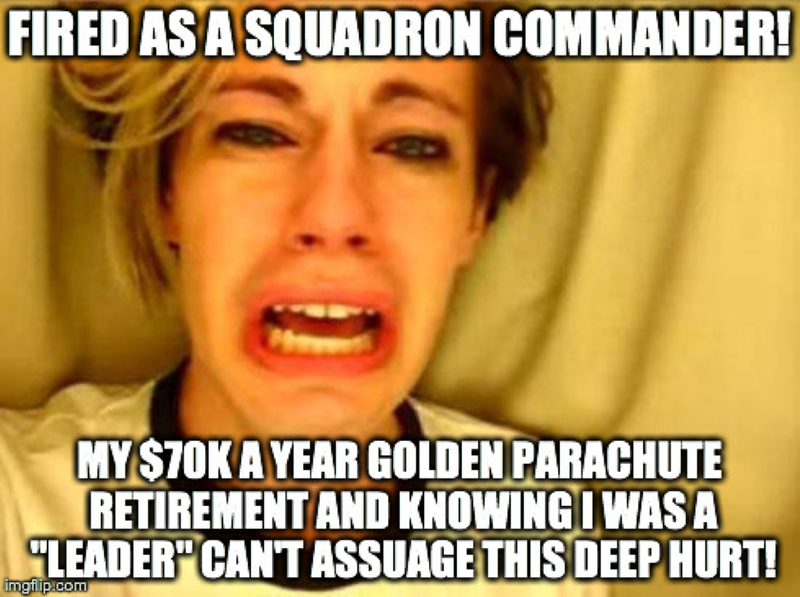 Your whining doesn't lead me to believe you knew what was important and what wasn't, and makes me think perhaps the Air Force got it right by removing you. If you need help coping, get it, plain and simple. Losing a job and moving rank in the top five of most stressful situation lists. Mental health still has a stigma that it shouldn’t, and you may even be improperly referred by your chain. When you get removed from the SNACKO position, you don't lose your job. You still have a job, you still get paid, so getting removed from a position is nowhere near the top five most stressful situations in any list. But if this traumatic event is so earth shattering to you, you should seek mental health. Perhaps have the counselor start off with hand puppets, and approach you as a three year old where your mental development apparently stopped. Whatever you do, please stop whining online. It's embarrassing that our service gave you a chance at command, but fortunately they've fixed the glitch. Move along.